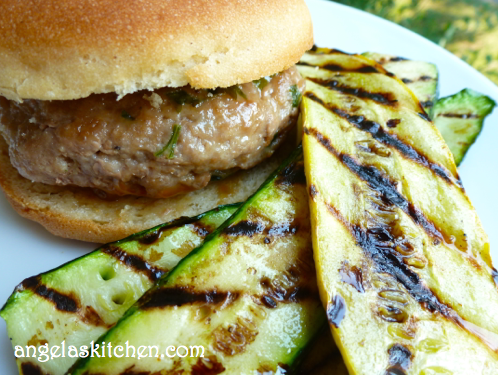 It is no secret I like a little Asian inspired flavor in my menu and these tasty Thai inspired burgers really hit the spot when you want something different from the average burger. I served these on my gluten free hamburger buns with grilled zucchini on the side. Yum! Mix all ingredients together until well blended. Form mixture into 6 patties and cook in an oiled skillet or grill until cooked through. To Freeze: After forming patties and before cooking, separate patties with waxed paper. Place patties into a freezer bag, remove as much air as possible, seal and freeze. To serve: Thaw. Cook in oiled skillet or on grill until cooked through. I made these the other night, and they turned out great. I did make some adjustments to fit my families taste buds. My husband said they reminded him of a meat he got while he was deployed, which was one a few good memories he has , so it was a good thing :0) thanks.